Eating Seafood: Health Boon or Health Threat? Since 2001, the federal government has issued warnings about the risks associated with eating certain fish that contain high levels of mercury. For decades, human industrial activities have emitted large amounts of mercury in the air, which then settles in our waters and has contaminated some fish and shellfish. When we eat fish and shellfish, we get a dose of mercury, and too much mercury can make humans sick. Scientists have found that high levels of mercury in humans can cause brain and nervous system defects. Mercury poisoning is of greatest concern in young, growing children and childbearing aged women, since it can affect the fetus. The federal government has warned that pregnant women (or women who plan to become pregnant), women who are breastfeeding, and young children should avoid eating high-mercury fish like shark, swordfish, tilefish and king mackerel. They also warned that they should limit their consumption of albacore tuna, another fish high in mercury, to no more than 6 ounces per week. You have probably heard about these warnings. But you have probably also heard that eating fish is healthy. In the 2011 edition of the federal Dietary Guidelines for Americans, they encourage Americans to eat 8-12 ounces (about 2 servings) of seafood per week. They say eating fish is good for you because fish contains an abundance of nutrients including healthy fatty acids known as omega-3s. Omega-3s have been shown to have numerous health benefits, like reducing blood pressure, improving heart health and aiding in fetal brain development. This conflicting advice by the federal government leads to confusion among consumers about whether they should eat fish because it's healthy or avoid fish because it's dangerous. As well, the advice given by the federal government about eating fish is incomplete and misleading. The federal government's mercury warning only mentions 5 fish that are harmful to humans, but there are other fish with moderate to high mercury levels that could also pose health risks to humans. The warning fails to mention that non-childbearing women and men who eat a lot of high-mercury fish can face dangers as well. And while it is true that seafood is healthy, not all seafood is equally healthy and not all of it contains abundant omega-3s. So which fish are safe to eat? And which fish provide the greatest health benefits? These are the questions that scientists with the Environmental Working Group set out to answer. Using recent data on mercury in seafood and the amount of omega-3s in seafood, the scientists calculated how much mercury and omega-3s adults and children would get when eating two servings of fish per week. They did this for each of the 35 most popular seafood species. The scientists found that 10 of the 35 most popular seafoods contained mercury levels that could pose a health risk to childbearing aged women if eaten twice weekly. And 19 of the 35 species could pose a health risk to children if eaten twice weekly. These included the known high-mercury species (swordfish, shark, tilefish, king mackerel, and albacore tuna), as well as seabass, Spanish mackerel, orange roughy and halibut. Additional species that contained mercury levels unsafe for children included snapper, canned light tuna, hake, haddock, freshwater perch and bass, carp and American lobster. The scientists also found that if children and most childbearing aged women consumed 6 ounces of albacore tuna a week, as advised by the federal government, they would exceed safe mercury consumption levels. How much mercury is too much for non-childbearing women and men still remains under debate (and likely varies among individuals depending on overall diet, health and genetics), but anyone who eats large amounts of fish or frequently consumes high-mercury fish could potentially face health risks. You may notice that many of the fish species that have harmful levels of mercury have something in common: they are large fish. As a general rule, larger, predatory fish have more mercury than smaller fish that are lower in the food chain. So, when choosing what fish to eat, the key to avoiding mercury is to eat smaller fish. 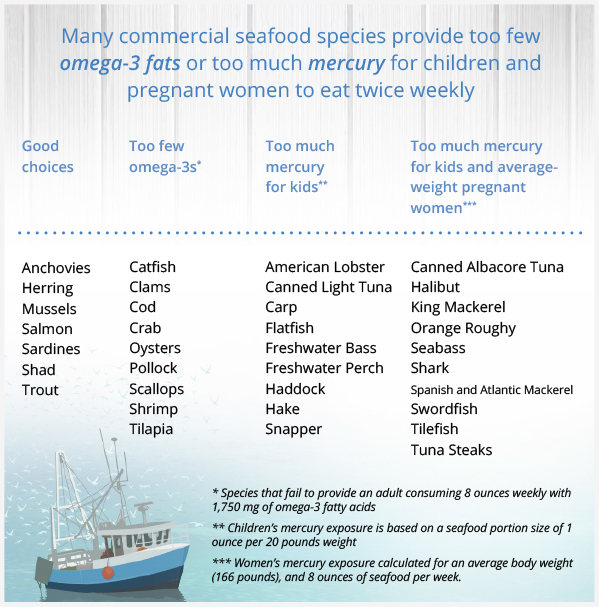 Graphic shows "good fish choices" that are high in omega-3s and low in mercury, fish that do not provide enough omega-3s when eaten twice weekly, and fish that have too much mercury to be eaten twice weekly by kids and pregnant women. Copyright © Environmental Working Group, www.ewg.org. Reprinted with permission. The Environmental Working Group scientists also found that many of the popular seafood items Americans eat, like cod, pollock, crab, clams, canned light tuna, tilapia, catfish and shrimp contain only low amounts of omega-3s. So Americans eating these species may not be getting as many health benefits as they think. But the scientists' analysis did show that there are several seafood species that do provide substantial amounts of omega-3s AND are low in mercury. One popular, stand-out choice is salmon. If you eat 4 to 8 ounces of salmon per week, the scientists say this can provide 100% of the recommended amount of omega-3s. The scientists with the Environmental Working Group recommend that consumers choose wild salmon over farmed salmon. Because of the way a lot of farmed salmon is raised, it may contain other contaminants. The scientists say that other excellent healthy fish choices include anchovy, sardines, mussels, herring and farmed trout. Eating 4-8 ounces of these species weekly can also provide you with the recommended omega-3s. And the good news is that there are sustainable options for all of these species! Some great "green" options include Alaskan salmon, Pacific sardine, U.S. wild-caught blue mussels, farmed mussels and U.S. farmed rainbow trout. Federal officials are working on updating their mercury in fish warnings and dietary guidelines. Hopefully this time around they will offer seafood consumers more complete and easy to understand advice. Stony Brook University's Gelfond Fund for Mercury Research and Outreach [a group Blue Ocean Institute has worked closely with on this important issue] says that the new federal advice should encourage all people to consume low mercury fish. Until new and better advice is available, we hope the above recommendations will help you choose seafood that is safe, healthy and sustainable! For more easy-to-understand information on mercury in fish, please visit Blue Ocean Institute's mercury in seafood web page! Also, check out the Gelfond Fund for Mercury Research and Outreach at Stony Brook University. View their letter to federal officials regarding seafood advice. The full results of the Environmental Working Group study on mercury levels and omega-3s in fish can be found here.